An autorickshaw driver who gives free rides to the blind, donates money to an old age home and is trying to raise funds for the treatment of a sandwich vendor. In our continuing series on Extraordinary Indians, A Ganesh Nadar meets Sandeep Bacche in Mumbai. 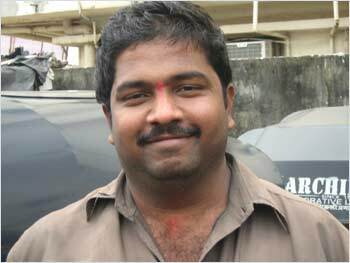 Sandeep Bachhe is an autorickshaw driver in Mumbai. More of him later, but first let me take you through his wonder autorickshaw. It has a television set tuned to good old Doordarshan — which incidentally is celebrating 50 years of transmission in India. Then there is also a board with the day’s price of gold, silver, dollar, pound and the yen. Behind the driver’s seat hangs another chart with phone numbers of hospitals, theatres, hotels and airlines. You can also pick up the day’s papers and a couple of magazines in the rack behind him. ‘Do not spit,’ another notice admonishes you. There are pictures of Gods from all major religions. “All are welcome,” he says with a smile. The signboards continue, and there is one that says, ‘Donate for old people’ with his mobile number below. Sandeep gives whatever he can spare to an old age home. He also collects money from like minded auto drivers to distribute notebooks among slum children. He points out four other auto drivers to me who had each given Rs 500 the week before to distribute books to needy children. Sandeep also gives free rides of up to Rs 50 to people who are blind and gives a 25 per cent discount to the physically challenged. He gets a physically disabled customer about once a month. If you are wondering where Sandeep gets his ideas and why he goes out of his way to help people, well, it is best described by him. Sandeep has studied up to Class 10. After that he worked for a tourist cab company for eight years. His elder brother Raghunath bought him this rickshaw as a gift to set him to earn his own living. Even while he worked with the tourist cab company, he had the foresight to get an autorickshaw driver’s license. This stood him in good stead when he quit his job. This philanthropist auto driver is one of five siblings — three brothers and two sisters — all of who completed their school, but did not have the means to go to college. His father toiled as a mill worker when Mumbai was a well-known textile city. When the mill closed down and in 1986, his father returned to his village while his elder brother got himself an autorickshaw permit. The same permit was used to buy Sandeep his rickshaw. The seeds of social work have branched to Sandeep’s wife as well who counsels HIV+ patients. As an outreach worker, she goes to patients’s homes and advises them about nutrition, child care and preventive measures to stop the further spread of the deadly virus. “She is a commerce graduate,” Sandeep informs me proudly. Talking about the genesis of his all-in-one auto, he says the idea was an offshoot of his days in the tourist cab company. On the occasions he had to stay overnight at the office, he would stay awake watching television in the tourist vans that belonged to the company. That experience gave him the idea of installing a television in his vehicle. The magazine idea was also taken from the company; its cars had the latest magazines for their clients. All these utilitarian fixtures found their way into the autorickshaw one by one. First came the television, the fan and then the different signboards. If it is a celebrity’s birthday, that too finds mention on the notice board! Sandeep and his friends regularly visit an old age home, taking biscuits, sometimes pulses, depending on the amount of money they can spare. His latest goal is to help a young boy whose name he doesn’t know. Sandeep meets the boy every day when he goes in the evening to have a sandwich. He is also paying for the convent education of his two children and is determined to ensure that they go to college. Painted inside his rickshaw is another sign which perhaps sums Sandeep Bacche best. ‘King of Bandra,’ it says after Mumbai’s tony suburb. That is the title his friends have crowned him with, and rightly so. He might not be the King of Bandra in wealth like Shah Rukh Khan who also lives in the suburb, but he is certainly the King of hearts. There are 55,000 autorickshaw drivers in Mumbai, but he is unique. I happen to travel with him today, and he was one of the most genuine and humble person I have ever come accross. After being amazed in his auto and the kind of work he does for other people.. all he told me at the end of our journy was… be the change you want to see ..